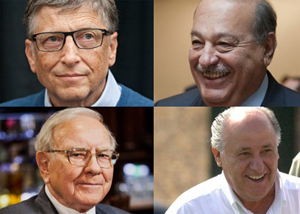 Look at picture shown above all these business tycoons are billionaires. They operate from various business industries. Majority of them are self made billionaire. Well do you want to become billionaire like them? If yes you are at right place in this post we will discuss about business that can make you billionaire. As per Wealth-X UBS Billionaire Census report 2014 total number of billionaire across world is 2325 & they are holding total wealth of 7.3 Trillion US$. Opportunities for significant wealth gains can be found across most, if not all, business, but certain business have been particularly important sources of billionaire wealth generation. The largest shares of billionaires continue to have made their fortunes through finance, banking and investment apart from that real estate and textile is another business which can make you billionaire. Warren buffet made all his wealth from finance sector. Bill Gates, Larry Ellison & Mark Zuckerberg has made wealth from IT industry. Jim Walton created wealth from retail industries. Billionaires are increasingly emphasizing towards diversified business ventures such as industrial conglomerates, especially in emerging markets. Billionaire is always actively engaged in two businesses. Despite of many obligations and responsibilities, billionaires are primarily engaged with one specific company or institution. This company or institution is referred to as their “primary business”. For most billionaires, the largest share of their wealth is held in this primary business, but they also have significant investments in their other business ventures. Other Types – Educational or nonprofit organization. 63% of billionaires primary businesses are private companies, compared to only 31% that are public companies and 6% that are other types of institutions (education, government, non-profit & social organizations). So, if you want to become billionaire than start your business in sector mention above.Make sure to do investments in other business also.